Tuareg: this is the name given to the nomadic people who journey across the sweeping sand dunes of Northern Africa. Easily recognizable by their traditional indigo garment, the Tuareg are a resilient, resourceful people. For centuries, Tuareg merchants established and maintained trade through the Sahara Desert to facilitate commerce between cities in West and North Africa. These caravans of the Tuareg transported numerous goods across the sands. Spices, wheat, gold, salt, and much more were all carried by camels and other beasts of burden through the various trade routes established over the years. As the caravans could seldom carry enough water to meet their needs in the inhospitable territory, oases, water holes, and any other source of water and food became critical to their survival. 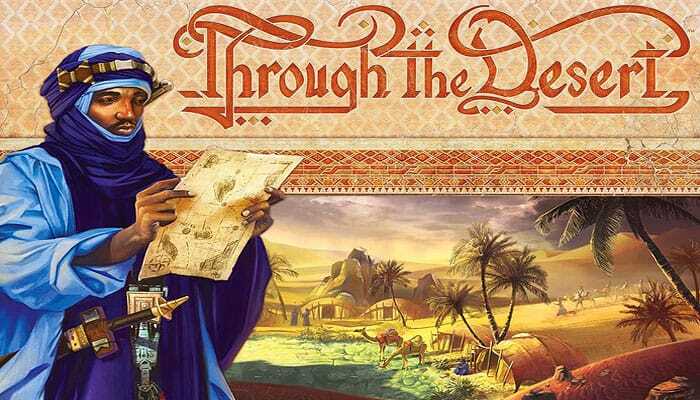 You lead a Tuareg tribe through the desert, vying for the best trade routes in this region of the wilderness. Expand your caravans wisely by making use of the scattered waterholes and gaining access to as many oases as you can. Among the shifting sands of the Sahara, the fate of your people rests in your hands. Each player attempts to score the most points by snaking caravan routes through the desert, trying to reach oases and blocking off sections of the desert. Many people feel that it is reminiscent of Go. 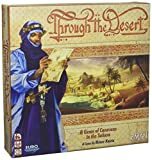 Through the Desert is part of the so called Knizia tile-laying trilogy. In Through the Desert, each player controls a number of caravans consisting of pastel-colored camels. Players take turns placing more of these camels on the board, expanding their caravans in order to score points. The game ends immediately after the last camel of any one color is played from the supply, after which players compare their point totals to determine the winner.